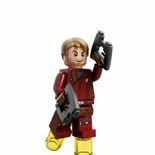 Star-Lord is a Marvel Super Heroes minifigure. 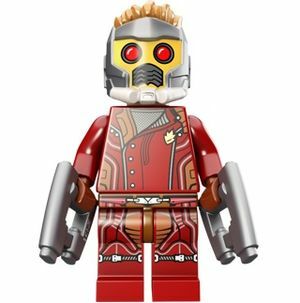 Both versions of Star-Lord have the newly moulded grey helmet that wraps around the head, the top of the helmet has his orange hair pushed up due to the helmet, the front of the has light grey pipes at the bottom for his re-breather, the face area is flat and gold, with large red circles for the eyes, and a dark grey mouth piece. The mask can be interchanged with a tousled orange hairpiece. His face has neutral and angry expression, a stubble beard and cheekbones to give the face shape. This variant has a dark red torso with black hands, and is printed with a trench coat, a light blue undershirt, and a strap that connects in two places. The trench coat continues onto the black legs, with a belt buckle. His torso is dark red with brown hands and is printed with his grey undershirt showing at the top of the chest, with the jacket closed and showing detail of the jacket like pockets, the flaps, and buttons. The printing continues onto the dark red legs, which is the same as Drax and Gamora's. 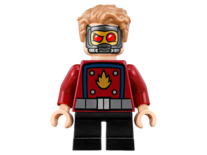 Star-Lord with his mask on. After the death of his mother, Peter Quill was abducted by space pirates called Ravagers, led by Yondu, who adopts him. Years later Quill, under the moniker Star-Lord, stole an Orb and was confronted by Korath, an ally to Ronan. While he escaped with the Orb, a bounty is placed on his head and Gamora was to reclaim the Orb. Quill attempted to sell the Orb on Xandar, the Nova Corps home world and was attacked by Gamora, the fight drawing the attention of Rocket Raccoon and Groot, bounty hunters who join in. However, the Corps arrest the four, and in prison they meet Drax, who wants revenge on Ronan for his family's death. He attempt to kill Gamora, before Quill convinces him otherwise. Working together the five escape the prison and head to a buyer Gamora had set up on Knowhere, a criminal spaceport. While a drunken Drax summons Ronan, the rest meet with Gamora's contact, The Collector. He revealed that the Orb is a case holding a powerful Infinity Stone that requires beings of immense power to weild it. Though, the Collector's aid tries to take the Stone triggering an explosion that engulfs the museum. After Ronan arrives, easily defeating Drax and stealing the Stone with the help of Gamora's sister Nebula, leaving Quill and Gamora to die in space. Yondu arrives and saves them. Drax, Rocket, and Groot try and rescue them, prompting Peter to negotiate a truce. All forces converge on Xandar to stop Ronan, who wields the Stone in his hammer. Rocket flies the Milano into Ronan's ship, causing it to crash to the ground, Groot sacrifices himself to protect the others. Ronan prepares to attack, but Quill distracts him allowing Drax to destroy the hammer and together the Guardains use the Stone to defeat Ronan. Quill tricks Yondu into taking the wrong container, while giving the real one with the Stone to the Nova Corps. The Guardians records are expunged and Quill learns that he is half-human, his father belonging to an ancient unknown species. He unwraps his mother's last gift before she died, a mixtape of her favorite songs and departs with Guardians aboard the rebuilt Milano, with a splinter of Groot in a pot re-growing. 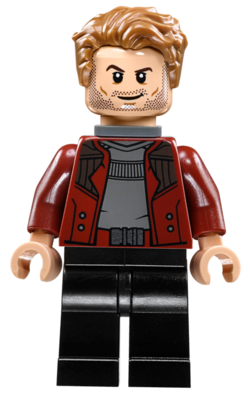 Chris Pratt, who plays Star-Lord in Guardians of the Galaxy, also voiced Emmet in The LEGO Movie and Owen in Jurassic World. Peter Jason Quill also known as Star Lord. As an interstellar explorer and pirate smuggler, Star Lord has done quite a bit of traveling on board the Milano. He is easily identified by his metal mask with glowing red eyes and a habit of getting into trouble. Brash, bold, and a bit of a ladies’ man, Star Lord is never seen without his mix-tape of music from his home planet, Earth. Star-Lord's Guardians of the Galaxy Vol. 2 grey suit variant with his mask on. Star Lord Peter Jason Quill also known as Star Lord. As an interstellar explorer and pirate smuggler, Star Lord has done quite a bit of traveling on board the Milano. He is easily identified by his metal mask with glowing red eyes and a habit of getting into trouble. Brash, bold, and a bit of a ladies’ man, Star Lord is never seen without his mix-tape of music from his home planet, Earth.